I mentioned in an earlier post that I was in Seattle last month and went to the Daniel Smith store. I bought some of their PrimaTek pigments and haven't really used them much up to now. 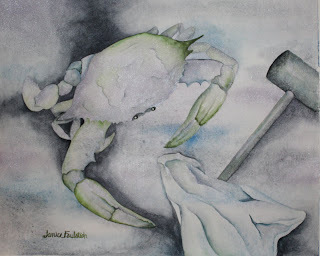 I decided to enlarge my crab from last month and try him with those pigments. I used 4 colors: Sodalite, Blue Azurite, Green Apatite, and Sugilite. I took geology in college, and I must say that I have never heard of the last 2 minerals! The paints have very unusual properties and were challenging to even get down on the paper, as they fall out of solution and separate from the binder very quickly. Some of them are quite gummy. The sugilite is a light violet and has a beautiful iridescence. The painting is 14" X 17". I was not trying to produce an acurate shadow pattern; my aim was more toward pulling the composition together. I also wanted to use negative painting-I managed some, but not as much as I originally planned.